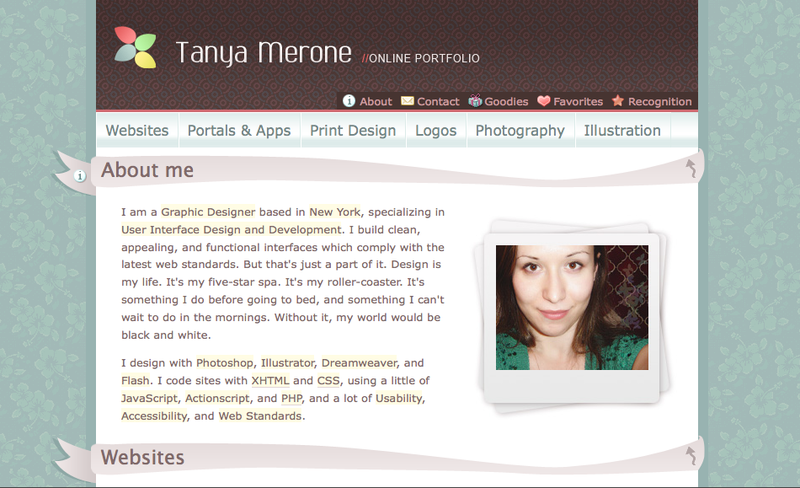 Tanya Merone is a graphic designer based in New York. She professes to be deeply in love with her trade and it shows in the artistry she pours in her work. She specializes in elegant, creative designs – her trademark in the design world. I enjoy creating designs that are elegant, organized, and clutter-free. At the same time, I like my designs to be modern and cutting-edge. Usability is an important aspect too. I love it when people look at the finished product – whether it’s an application, a website, or a postcard – and find the user experience and presentation intuitive. What were the projects you worked on that became your favorites? My favorite project would probably have to be the NFL intranet portal. The client envisioned it as a very dynamic site filled with colorful imagery, that invited a lot of creativity from my end. Plus, the client was very receptive to new ideas. They were happy to consider them even if they did not end up using all of them. What are your pet peeves as a designer? One of my pet peeves is design that requires an instruction manual to navigate. It may be creative, but is far too unpractical for most uses. Another pet peeve is slow machines. I often work on-site at corporate clients who require me to use their hardware. Some hardware can barely handle basic computing and chokes on Photoshop. Design always tries to achieve a goal – deliver a message, simplify an interface, present information to a user. I get immense satisfaction from seeing the user understand the message instantly. Steve Krug said it best when he titled his book “Don’t Make Me Think!” Expressing my creativity through this type of design is what I love most about my job. Your top five favorite websites in terms of design! Vlad Studio I love the wallpapers Vlad makes! How would you describe a successful designer? A successful designer is first and foremost, a person who follows their passion. You have to be in it because you love doing it, and not be afraid to experiment with your style. Successful design is all about switching things around and creating new twists for the old true and tried ways. And usually, when your great work speaks for itself – consider yourself successful. What are your other passions aside from designing? Spare time is a luxury for me. Whatever spare time I have, I spend with my family and friends. I also love jogging, cooking, and taking photos.